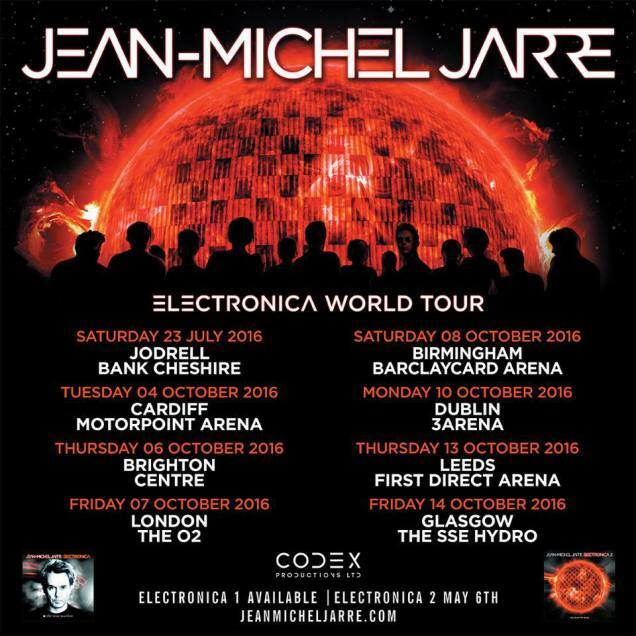 Jean Michel Jarre's Management have released today the Official Tour Date List for Jean Michel Jarre's forthcoming 'ELECTRONICA WORLD TOUR', which officially starts at the Sonar Festival, Barcelona, Spain on June 17th 2016, includes 7 UK dates (including the Bluedot Festival, Jodrell Bank, England on July 23rd 2016), and ends in Paris, France on December 12th 2016. 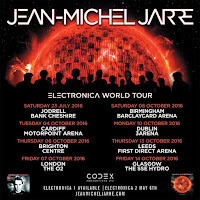 The 'ELECTRONICA WORLD TOUR' is expected to continue into 2017, and may feature dates in the United States, as well as further European dates, according to Jean Michel Jarre's Management. Tickets should be on sale for all of the above dates from today from various ticket outlets associated with the above venues. For further information about Jean Michel Jarre’s ’ELECTRONICA WORLD TOUR', please visit his Official Website (www.jeanmicheljarre.com) and/or his Official Facebook Page (www.facebook.com/jeanmicheljarre).